Considering the unfortunate circumstances in Syria and Egypt presently, I thought I would present some art from that region to show what beautiful things have come out of Syria and Egypt. I often wonder if troubles in the Middle East don’t stem from the fact that the borders of “countries” of Islam were so fluid historically. They were only established in the 1800s and 1900s as the result of European colonization. This mosque lamp is a perfect example of the fluidity of influence of certain periods of ruling dynasties that spanned large sections of the Middle East. How can one make borders for one country that for centuries has experienced multiple cultural, linguistic, and artistic impacts? The Mamluk dynasty controlled most of Egypt, western Saudi Arabia, and the west coast of the Middle East from ca. 1250 to 1517. Because imagery of humans or animals was discouraged by the Qur’an (the Muslim holy book), decorative arts with non-figurative designs flourished during the middle period in art of Islamic countries (ca. 1000–1400). Blown glass objects decorated with gold leaf and enamel reached their most refined point during the Mamluk period. Glass-blowing had been an established art form in the Middle East, and especially Egypt, since the 3rd millenium (2000s) BCE. The art form itself is thought to have originated in the Middle East. The foot and the body of this vessel were blown separately, the foot being attached to the bowl while it was still molten. Vessels such as this lamp were hung from the ceiling of mosques, mausoleums, and palaces from chains. The glow of such a lamp symbolized divine light, the eternal presence of God. Often such lamps were decorated with calligraphy that quoted the Qur’an. 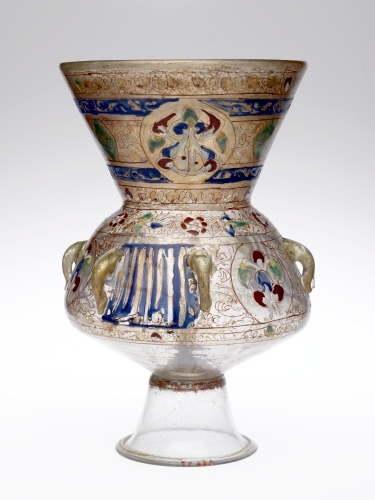 The sophisticated glass art of Egypt, and subsequently Syria, was a major influence on the growing industry of glass blowing in Venice at the time. Venice was one of the major ports for trade with countries in the Islamic world, and countries of Islamic faith exported glass wares such as vases, candle holders, bowls, and lamps. This lamp is unique as it is one of the few still containing its original wick. 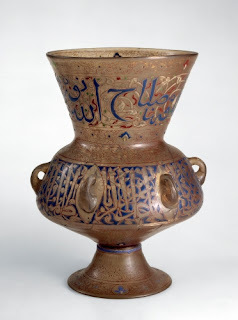 Check out another mosque lamp, this one from Egypt. The inscription in Thuluth script attributes this vessel as a donation for a fortress-monastery by the official Karim al-Din.